From Umphang district, take the road (Umphang-Ban Pal La Ta) for about 27 km. Inflatable boat, local guide, safety gear, accommodation, food and parking. 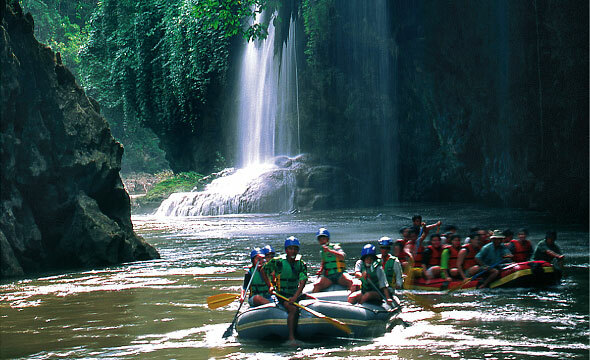 Thi Lo Re white-waterrafting journey starts at the Mae Klong River’s headwater – one of the challenging streams. The idea of rafting down the Mae Klong River – a series of adventurous rapids and fantastic scenery with abundant lush green forest on both sides as a background, must have inspired the imagination of not a few explorers. Day 1: Get your body and soul ready. Let the adventure begin! You start paddling from Ban Pa La Ta, passing “Kaeng Le Ka Te” – the first checkpoint where there are 3 exciting rapids clustering together for approximately 200 m long and very meandering. 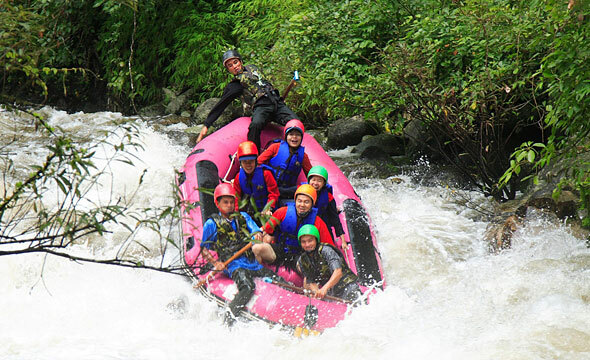 Next point is “Kaeng Bandai”, which has a cluster of 3 rapids similar to the first one but with a much shorter length. Then there is a beach where you can stop to take a break. 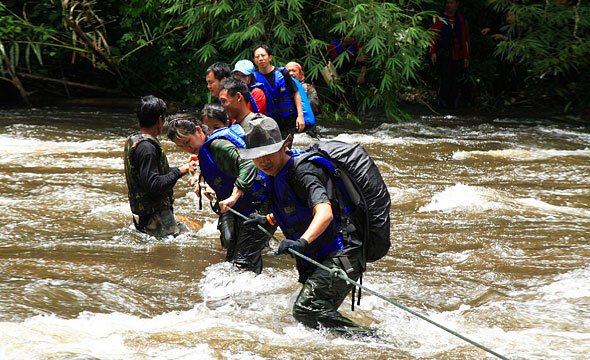 Once regaining your energy, “Kaeng Tukkae” – a small rapid with a length of 20 m is ahead. However, this rapid will probably be submerged when the water level is extremely high. After conquering 3 easy islets, now it is time for the real thrill. “Kaeng Hak Sok” is a bottleneck-shaped rapid with 150 m in length naturally created by two huge boulders (resembling a bottleneck) that force the stream to flows powerfully downwards. “Kaeng Namtok Noi” is a small 30-m long rapid, with massive rocks in the middle of the waterway. The white-water rafting team needs to be united in manoeuvering the raft in paddling away from the boulder. Otherwise, the raft could be forced to flip upside down. 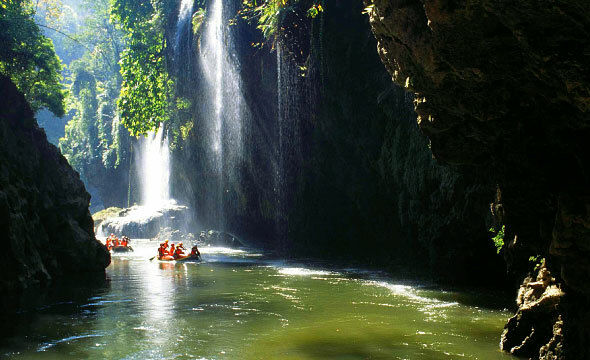 “Kaeng Kon Mong” is an ultimate thrilling spot where you have to navigate the boat through 3 rapids in a row (approximately 200 m long). With boulders and ledges blocking the waterway like a bottleneck, the width of the stream is therefore getting smaller in width, causing the current to flow very rapidly. When the level of water is high, the current will be extremely strong. The current can run into the ledge, causing the water to pile up and create pressure waves, just like boiling water. After completing the 1st-day’s white-water rafting mission in the late afternoon, it is time to set up a riverside campsite. You will have your precious time to rest, relax and get ready for the next ride on the 2nd day. Begin the Day 2 journey with the inflatable raft through “Kaeng Ka So Chi Kae”, which is 40 m away from the campsite. You will see a huge boulder, standing firmly in the middle of the rapid, splitting the river into 2 streams which later merge into a single stream. The next one is 60-m-long “Kaeng Ok Taek”, which has a strong flow of water despite its small size. Away from this rapid for another 200 m, you will see the roughly 80-m-high beautiful “Te Lo Re Waterfall” where is the final destination. During the neap time, a line of rocks will emerge above the water and you can walk around or play in the water. On the way back to Pa La Tha Village, you can choose to go back either by foot or on elephant back. The total distance is around 35 km and will continue by car to Umphang district for another 27 km. "Stay over on the islands for a couple of nights." "Fish feeding indirectly ruins the ocean ecosystem. Do not crash or step on the coral reefs, especially the areas with strong currents."